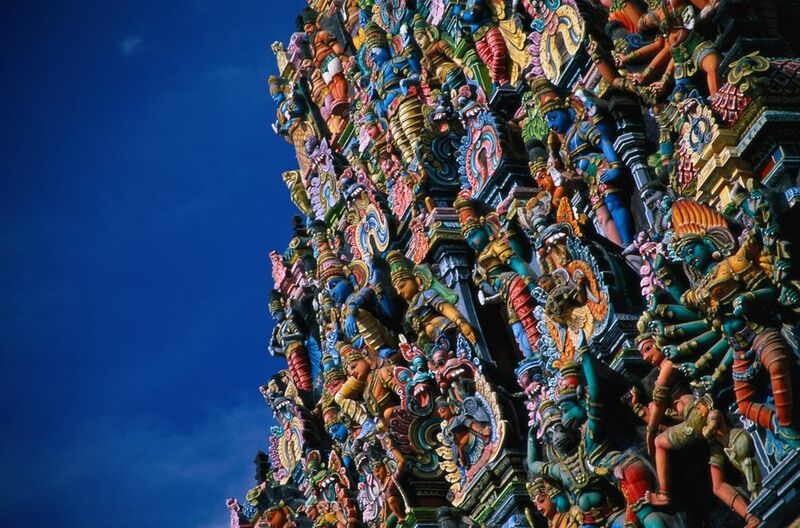 The most impressive and important of south India's temples, Meenakshi temple in Madurai dates back as far as 3,500 years! Apparently, the city was built around the Shiva lingam that's inside its sanctum. The temple complex covers 15 acres, and has 4,500 pillars and 12 towers -- it's massive! The temple's four main towers and entrances each face one of the four directions (north, east, south, and west). The tallest one, the southern tower, stretches nearly 170 feet (52 meters) high! Inside, there are two main shrines -- one dedicated to Goddess Meenakshi (also known as Goddess Parvati) and the other to her husband Lord Shiva. Meenakshi's shrine, which is green, houses a piece of emerald that was brought back from Sri Lanka in the 10th century. The temple also contains a 1,000 pillared hall, temple art museum, holy golden lotus tank, musical pillars, stalls selling everything from plastic toys to bronze images of the Goddess, and many smaller shrines. 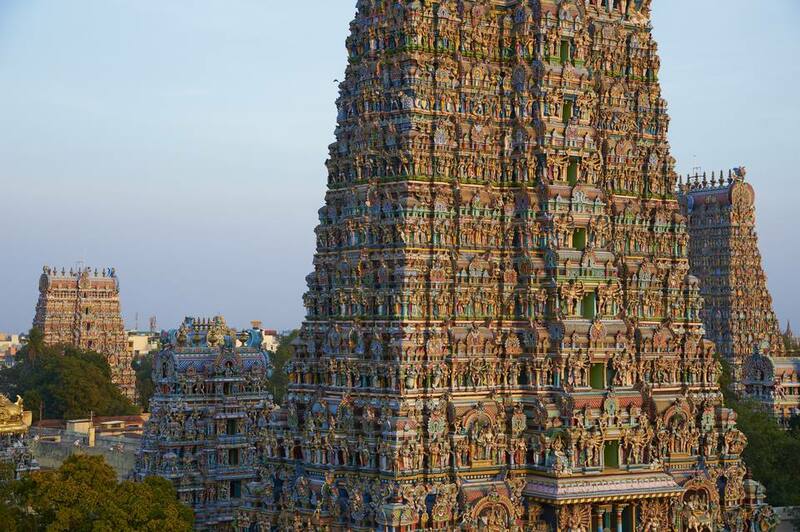 The bottom part of the temple is made from granite, while its towers (gopuram) are made from limestone. On them is an astonishing array of sculptured and brightly painted gods, goddesses, animals, and demons. The famous southern tower was constructed in 1559. The oldest tower, which is the eastern one, was built by Maravarman Sundara Pandyan from 1216 to 1238. However, much of the work was carried out during the reign of Tirumalai Nayak, from 1623 to 1655. The sheer size of the temple means that it's easy to get lost inside, and there's so much to see and marvel over that you could easily spend days there. It's a "living" temple, full of industry and a constant stream of couples waiting to be married in its corridors. Although non-Hindus can wander around inside the temple, they can't enter the shrines. Every April a famous Chithirai Festival takes place in the streets surrounding the temple. This festival reenacts the wedding of Lord Shiva (Sundareswarar) to Goddess Meenakshi. In Madurai, Meenakshi is regarded as Lord Vishnu's sister. Traditionally, Lord Vishnu has high caste followers, while Lord Shiva is worshiped by those of lower castes. What's interesting to note is that her marriage to Lord Shiva unites people of all castes, hence bridging the caste gap. In October 2017, the Indian government announced that Meenakshi Temple was the best "Swachh Iconic Place" (Clean Iconic Place) in India, under its "Swachh Iconic Places" initiative to clean up the country's heritage sites. A project to clean the periphery of the temple is also expected to be completed by March 2018. The aim is to make the streets surrounding the temple completely free of plastic. Bins for biodegradable and non-biodegradable waste have been placed in strategic locations, and sweeping vehicles will regularly clear the area. There are also 25 electronic eco-friendly public toilets and 25 water dispensing units for tourists to use. Meenakshi Temple is open daily from dawn until 10 p.m., except for when it closes between 12.30 p.m. to 4 p.m. This is because Hindu scriptures specify that an abode of Lord Shiva must not remain open in the afternoon. It's best to visit the temple once in the morning and once in the evening (for the night ceremony). The temple's main entrance is on the east side, and non-Hindus can enter from there. Conservative dress, which does not reveal legs or shoulders, is a must. You can safely store your camera and other belongings inside a locker at the stall that minds shoes at the east entrance to the temple. After doing so, your bag will be scanned by an X-ray machine and you'll be manually searched by guards. The temple's main attraction is its stunning Hall of 1,000 Pillars. In reality, there are only 985 pillars, each with magnificently carved statues of yaali (a mythical lion and elephant hybrid) or Hindi deities. The hall was built in 1569 by Ariyanatha Mudaliyar, general and chief minister of Madurai's Nayak dynasty. Its colorfully painted ceiling is also captivating and features a striking wheel of time. There's a set of musical pillars and Art Museum that are worth seeing as well. Tickets cost 50 rupees for foreigners and 5 rupees for Indians. Only Hindus can go into the inner sanctums to see the idol of Goddess Meenakshi and Lord Sundareshwarar. If you don't want to wait for up to three hours in the free lines, it's possible to pay extra for "special darshan" tickets. These tickets provide direct access to the idols and can be purchased inside the temple. They cost 50 rupees solely for Goddess Meenakshi, and 100 rupees for both deities. 5 a.m. to 6 a.m. -- Thiruvanandal pooja. 6.30 a.m. to 7.15 a.m. -- Vizha pooja and Kalasandhi pooja. 10.30 a.m. to 11.15 a.m. -- Thrukalasandhi pooja and Uchikkala pooja. 4.30 p.m. to 5.15 p.m. -- Maalai pooja. 7.30 p.m. to 8.15 p.m. -- Ardhajama pooja. 9.30 p.m. to 10 p.m. -- Palliarai pooja. If you wish to take a guided tour of the temple, which is recommended, Madurai Inhabitants are very knowledgeable. Alternatively, you'll find guides waiting at the temple entrance. Pinakin also provides downloadable audio guides on their app. One of the highlights at Meenakshi Temple, which non-Hindus can see and you really shouldn't miss, is the night ceremony. Every night, an image of Lord Shiva (in the form of Sundareswarar) is carried out from his shrine by temple priests, in procession in a chariot, to his wife Meenakshi's shrine where he'll spend the night. His gold feet are brought out from her shrine, while his chariot is fanned to keep it cool, and a puja (worship) is performed, amidst much chanting, drums, horns, and smoke. The night ceremony starts at 9.00 p.m. daily except Friday. On Fridays, it gets underway between 9.30-10.00 p.m. Madurai Inhabitants offer tours. Watch videos of the night ceremony: Lord Shiva being carried in a chariot, Lord Shiva being fanned, Lord Shiva's feet being brought out, and the night ceremony puja.